Home » News » Starbucks Trenta — Who Needs This Much Coffee? Starbucks Trenta — Who Needs This Much Coffee? Starbucks is going big with its new size of very, very large cup called Trenta, which holds 916 ml of liquid. The Trenta will only be for iced coffee, iced tea and iced lemonade, which is somewhat more comforting in the event you had a spill. Dumping almost a litre of hot liquid on yourself would ruin anyone’s day. The name is fitting, and follows Starbucks’ use of traditional Italian words instead of small, medium and large. Trenta means “30” in Italian — holding 30 ounces of brew (closer to 31, actually). Starbucks’ new Trenta will cost customers an extra 50 cents and be available May 3 in all U.S. shops. It will debut in 14 states sooner, including Arizona on January 18 and in California on February 1. The Seattle-based company says the new size is in response to customer demand for a larger cup. The company didn’t provide details on when Trenta will be available in Canada. 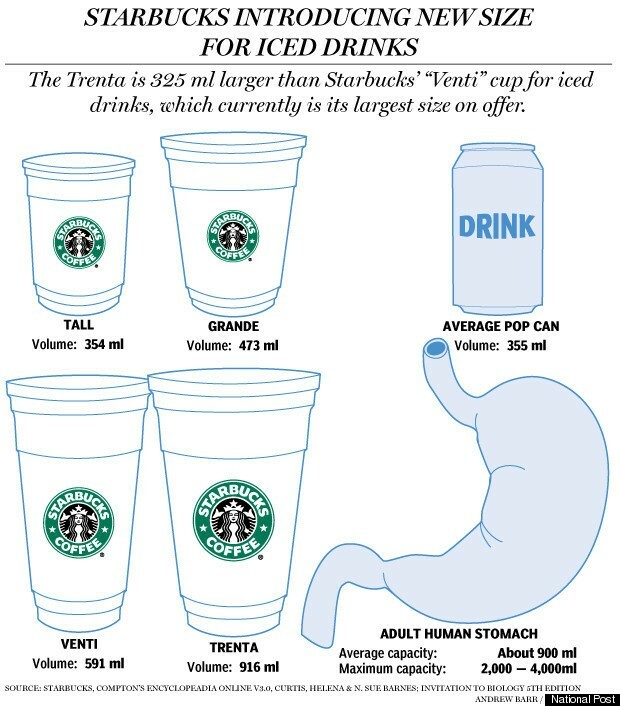 Click the graphic above for a better understanding of how the new cup size compares to the average adult stomach.